It’s been so long since I’ve used ribbon that I’d forgotten how nice it can look and I especially like it with this gorgeous bride from Penny Black. This is a card that I was lucky to have published by The Australian Cardmaking, Stamping & Papercraft magazine for a ‘ribbon’ feature. I’ll be back in a couple of days with another video, so glad you could visit. Other Supplies: Prismacolor Pencils – Eggshell, White, Light Peach, Peach, Pink, Magenta, Blush Pink, Dark Brown, Sepia, Sienna Brown. < Previous Video : Super Duper! Next > Video : It’s time for ‘Pretty’! Gorgeous Therese! This reminds me so much of our youngest daughter’s wedding! Fabulous creating/designing! TFS! Absolutely stunning! Love everything about this card – the trimmed edge, the image, colours and yes, the ribbon is perfect! Mesmerizing, jaw dropping beauty !! Such a beautiful card Therese. I love it, so simple yet so elegant. Your card is beautiful, your bow is beautiful (what is the secret to bow tying? )….a bride receiving this would be so delighted. I just watched a tutorial for “bow easy” what a neat tool. Therese, this is such a beautiful card, no wonder it was published. Imagine receiving this beautiful delightful card. Totally love the strip down the side and the ribbon. This is so elegant Therese! I would never have thought to use the ribbon for the bow of her wedding dress. Love it! Beautiful card Therese, love all your work! 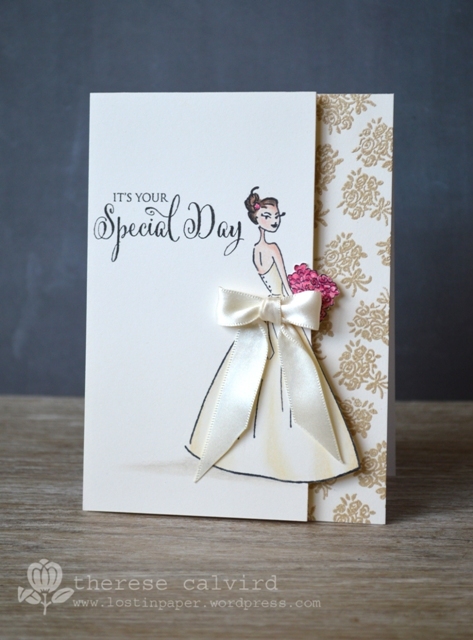 The bow is perfect on your beautiful card. WOW your ribbon is just so dreamy… and this card is just stunning! Congratulations for being a MFT Card Design Super Star! Well deserved! Absolutely FABULOUS way to use ribbon!!! OH my STUNNING…LOVE it so gorgeous..what a great idea to use ribbon! Congratulations on your big Superstar status over at My Favorite Things! Your card today, as usual, is absolutely fabulous! A beautiful card. I love the ribbon. I absolutely adore this card! Beautiful and perfect. Oh, WOW, Therese!! Your card is absolutely the most stunning wedding card I’ve ever seen…very elegant!!! Don’t forget your ribbons…look at this elegant wedding card Therese made to share with us! Stunning, elegant, sophisticated yet fun, LOVE this!!!!! Stunning card ! Greetings from Costa Rica! Your bow is absolutely GORGEOUS, Therese! It’s so elegant, and perfect for this beautiful image! No surprise to me that this stunning card is published, too…Congrats!!! Such an elegant and stunning card, Therese! You did it again! Another jaw dropping design! Love how elegant it is and how perfect that ribbon is on the dress! Congrats on the publication, Therese! My goodness, this is so beautiful Therese!!. I love the gold floral embossing down the side and that bow is the perfect embellishment over her dress. I bet it looked amazing in the magazine too! Your a card making legend! This is so elegantly stunning! Wow, just wow. So elegant and the ribbon looks amazing.